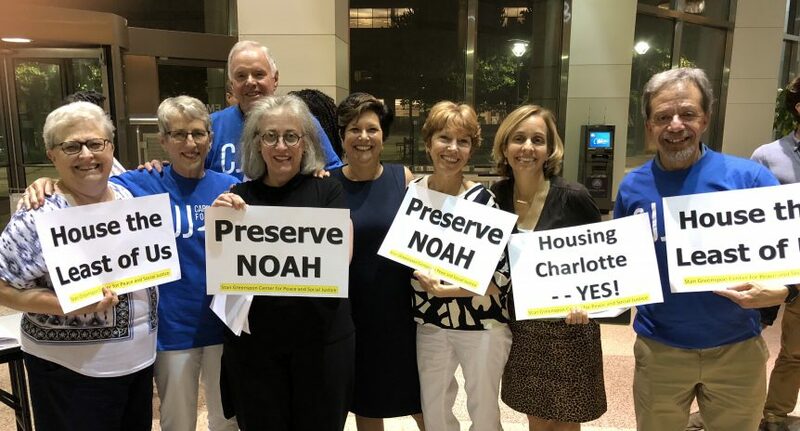 On Monday August 27, the Charlotte City Council unanimously passed an amended Housing Charlotte framework as a toolkit for the upcoming $50 million housing bond and the private sector match. We at the Stan Greenspon Center led a coalition of advocacy groups that reshaped this framework to help those with the least financial resources find housing and to protect more tenants from skyrocketing rents and displacement, along with creating a voice for those who are homeless or displaced. How did this framework evolve? We started by inviting members of other advocacy groups to join us in creating a common platform. Our coalition partners included the Carolina Jews for Justice (Greater Charlotte chapter), the Homeless Services Network, DoGoodCLT, the Council for Children’s Rights, two housing agencies, and others. We eventually collected more than 100 individual signatures in addition to our agency endorsements. We explained our platform to nine of the eleven City Council Members, one at a time, over the course of three very busy weeks. We had learned from our successes advocating for the City budget that our best approach was with a single sheet of paper and two issues, and this approach again proved fruitful. The momentum we created led to a meeting with Mayor Lyles and City staff to discuss our proposed changes. Over the course of the next few days, we worked out a compromise platform which staff integrated into the framework — setting us up for success with a single vote on the revised framework rather than a vote on the original framework and a second vote on the amendment. We are sorry that we did not get the opportunity to assemble all our volunteers and supporters together for a photo before we left City Council so that you could see the faces of grassroots advocacy. The image posted with this blog was one photo we were able to capture. The enormous smiles say it all!